What makes Country Heat effective? Because it’s the workout you’ll actually stick with! 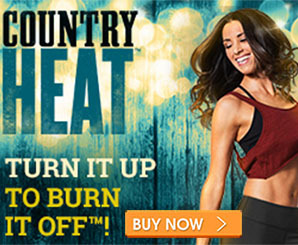 Country Heat makes it fun and easy to get fit. • 5 high-energy dance workouts and 1 Dance Conditioning workout give you all the calorie-burning benefits of a great cardio workout while using every muscle in your body to fire up your metabolism. • No complicated moves, no weights or equipment—just follow along for 30 minutes. • Dancing to country music is such a blast, it barely feels like a workout! • Autumn’s foolproof portion-control container system and Eating Plan let you lose weight by eating what you want in just the right amounts.